Free public event Saturday April 13, 2019 at 1 PM at the Longhouse. The many generous contributions from individual donors. 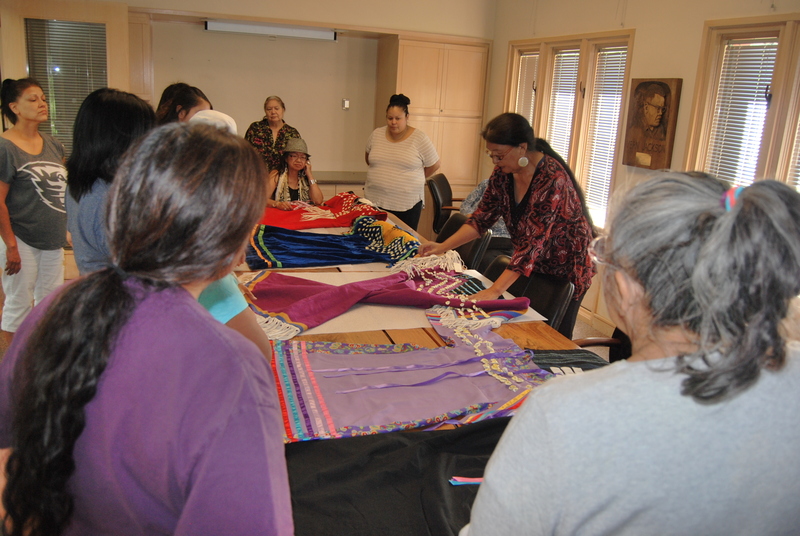 Roberta Kirk sharing five Plateau dresses with workshop participants. Two of the dresses are in The Museum at Warm Springs collection. 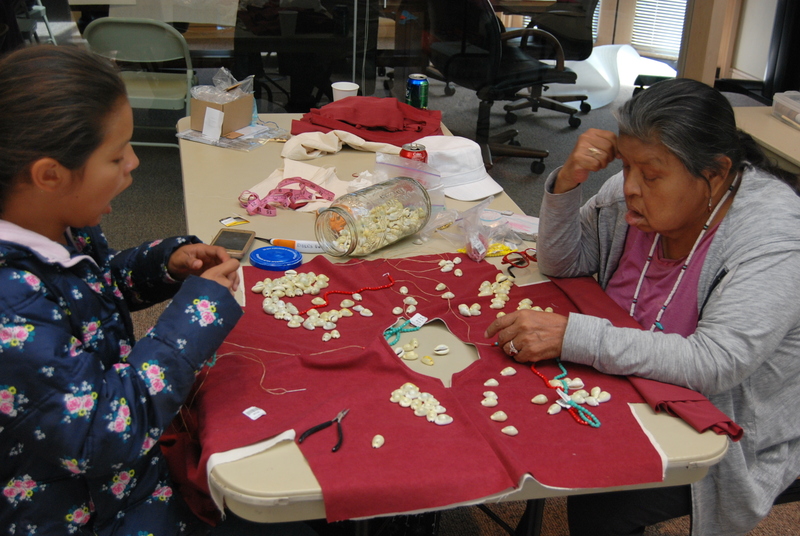 Roberta Kirk, Warm Springs tribal member, led a four-day Plateau dressmaking workshop at the Museum at Warm Springs from Thursday, June 28th to Sunday, July 1st. The workshop, organized by Linley B. Logan, was part of The Evergreen State College Longhouse Northwest Heritage Program. Linley leads the organization of the program by working with tribal and native communities to develop artist in residence programs focused on cultural arts. This Plateau dressmaking artist in residency received a great response. We hosted 18 participants who represented multiple generations and many interfamily groups. The youngest participant, Virgilena Walsey-Begay, is ten years old and she worked on her dress with her mother, Cece Walsey-Begay, and Virgilena’s sister in-law, Courtney Fasthorse. Virgilena danced in her dress at the Simnasho Hot Summer Nights Pow-Wow three days after completing it. Our dressmaking space at the Museum at Warm Springs was at capacity, with folks spreading their dress material out on the board room table and the floor in the hallway. We ended up with a wait-list of 20 people who are interested in a future Plateau dressmaking workshop. Plateau dressmaking workshop participants (left to right): Yvette Leecy, Judith Johnson, Roberta Kirk (instructor), Nicole Charley, and Angela Anne Smith. Redina Billy and Redinea McKinney work in the background. Roberta has great respect for all tribes and ways of cultural artistic expression: "I was taught our cultural value that when you are going into ceremony or you will stand before the Creator that you must present yourself in your best traditional attire." 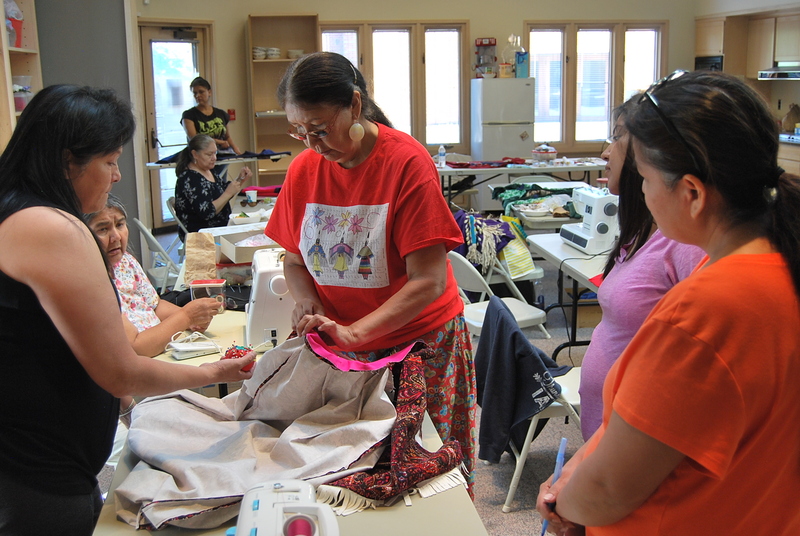 The Plateau dressmaking residency proved to be a very powerful arts-in-action connector for community members. A number of the participants were making their dresses for family naming ceremony purposes. Many of the residency participants had great things to say about their experiences. One artist said, “This artist in residency is a blessing of wonderful days filled with laughter and love.” Another artist noted, “It was so beautiful to see the dresses come alive. Truly, each dress has the spirit of its maker in it.” Yet another artist noted, “Everyday held prayers, laughter, sharing, and cultural creativity.” An elder participant commented, “It was a thrill to see the young one sewing her shells on her own dress. I am inspired.” Another participant shared, “The artist in residency was a beautiful four days with family, friends and new friends.” One participant shared, “When I completed the last stitches in my dress, I cried. I mourn no more; my life has come together as well as our families. I am so proud to be released and lifted by my friends through making this dress in this artist in residency. Thank you to the organizers and leader of this artist in residency for providing a means of healing for me.” A healing song was shared by another participant for the healing tears that day. Carlicia Dixon and Colleen Johnson work on Carlicia's dress. The participants in the Plateau dressmaking artist in residency discussed the idea of organizing a Plateau dress fashion show with their dresses at a future Museum at Warm Springs event. Participants in the Plateau dressmaking artist in residency pictured from left to right. Back row; Tricia Charley, Tiyana Casey, Linley B. Logan, Courtney Fasthorse, Roberta Kirk, Angela Anne Smith, Yvette Leecy, Nicole Charley, Judith and Merilda Charlery. Front Row; Matilda Wallulatum, Aurolyn Stwyer, Cece Walsey-Begay and Virgilena Walsey-Begay, Sara Dowty, Redinea Mckinney, and Redina Billy. Missing from the photo Violetta Vaeth, Marcus Johnson and Colleen D. Johnson. The Longhouse Education and Cultural Center and the Northwest Heritage Program are excited and very proud to be able to partner with The Museum at Warm Springs to develop and host such incredible, culturally powerful, and healing community-based artist in residencies in a native community. We are thankful to everyone who makes these residencies possible. Migwech, Gunalchéesh, Nia:weh, We are Thankful. Traditions in Carving workshop participants holding their West Coast Chinook-style canoe replicas. Left to right: Michelle Ward (Siletz), Ruby DeWilde (Athabascan), Carson Viles (Siletz), Gasun McCabe (Siletz), and one of the workshop organizers and lead artists, Shirod Younker (Coquille/Coos). 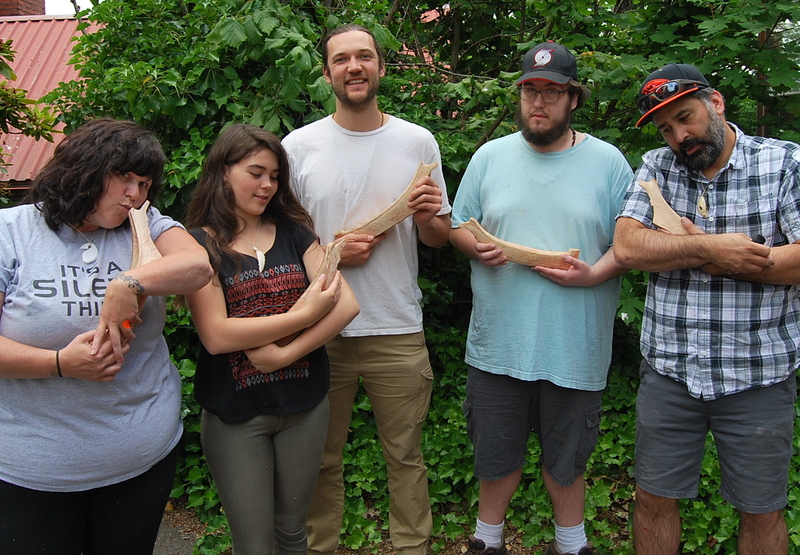 On June 11th-15th, the Journeys in Creativity: Explorations in Native American Art and Culture program held the Wood & Bone: Traditions in Carving artists in residence camp for seven Native American participants in Portland, Oregon. The week started with an introduction to bone carving traditions, taught by local resident and Hawaiian transplant, Kaliko Yokoyama. Students were expected to use their unique tribal aesthetics and translate, carve and polish small bone, antler or Corian materials into small pendants using rotary tools, files and sandpaper. Traditional wrapping techniques to make cordage were used to help fix and string the pendants so that participants could wear their newly finished pieces of art. After completing the two-day bone carving workshop, students transitioned to a three-day wood carving workshop, taught by Shirod Younker (Coquille/Coos). The students learned the basics of wood carving using traditional bent and straight knives. Each student was given a 12-inch block of fresh-cut red alder, roughly cut down to a small canoe. Students learned the basics of rough stock removal and finishing techniques using the knives popularized by the traditional carvers of the Pacific Northwest. The basics of carving canoe models gave the students a unique perspective on the traditional design and science of making a replica West Coast Chinook-style canoe. The Chinook canoe style, designed to handle the rough waters of the Pacific, is believed to be more than 5,000 years old. At the end of the last day, participants were each given a traditional bent knife and a rotary tool to help perpetuate their newly learned skills during potential future projects. 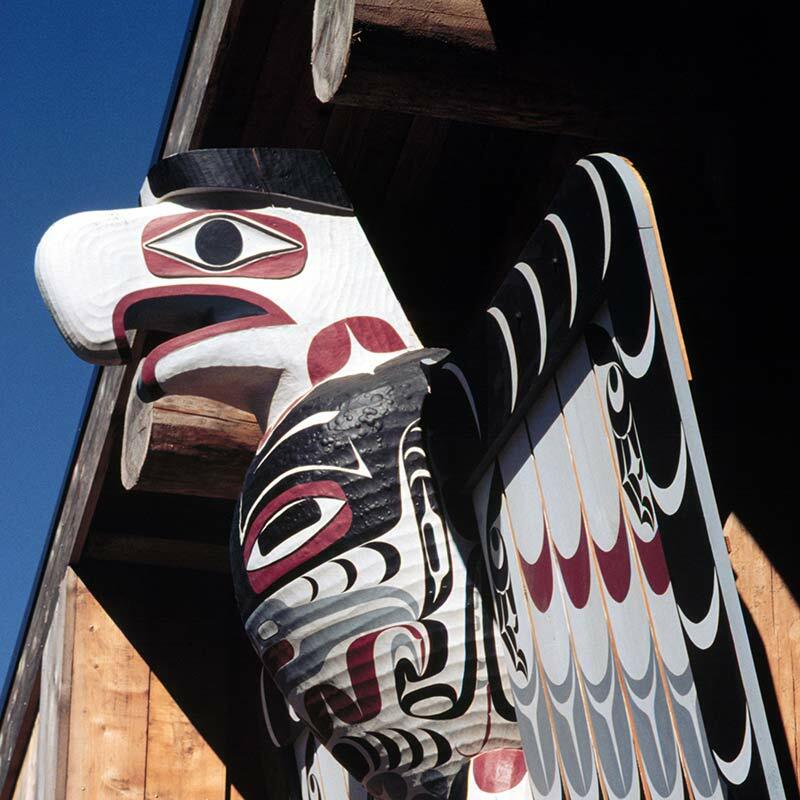 The Artist in Residence program is run by the Northwest Heritage Program of the Longhouse Education and Cultural Center. Including award announcements, a staff introduction, and Indigenous Arts Campus progress and plans! We're proud to recognize Lillian Pitt and Charlene Krise as the 2017 Longhouse s3hlihl "Teaching by Example" honorees. We're also pleased to share that two of the Longhouse’s lead artists in residence, Nora Naranjo Morse and Yvonne Peterson, received Spirit Aligned Fellowships as Legacy Leaders. They are the first among eight elder female indigenous artists in North America to be recognized for their work by the Spirit Aligned Leadership Program, which is based in New York. 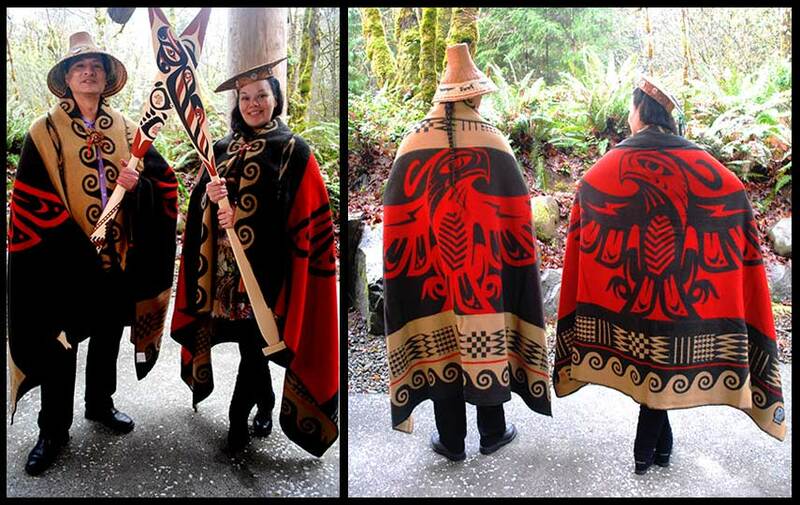 We honored all of these extraordinary women's accomplishments during the Longhouse Community Dinner in November. 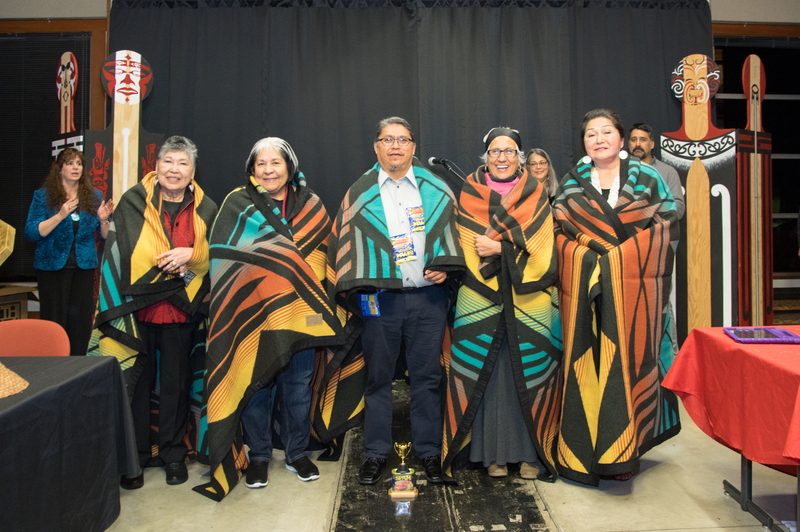 Marwin Begaye (center) was honored with the Longhouse's annual SPAM Award, developed by Ed Edmo to recognize those who embody the "spirit of laughter". Lillian Pitt, Yvonne Peterson, Marwin Begaye, Nora Naranjo Morse, and Charlene Krise were honored at the Longhouse Community Dinner. Photograph by Melissa Ponder. We are proud to announce the most recent recipients of the Native Creative Development ProgramTM grants. Native Creative Development ProgramTM grants are awarded annually to Washington and Oregon-based Native American artists working in visual, performance-based, media, or literary arts. Grantees are selected by a committee of local and regional experts and receive between $2,500 and $5,000 to support their development as professional artists. 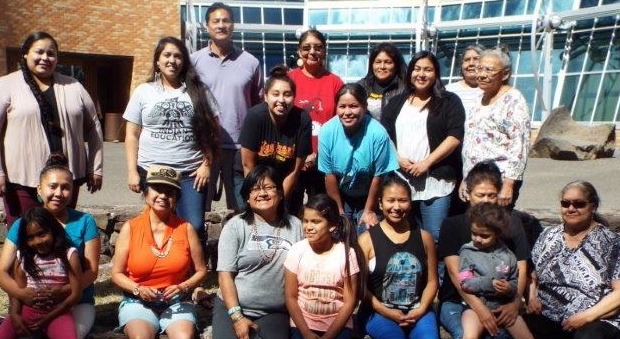 The Longhouse Education and Cultural Center has administered the Native Creative Development ProgramTM since 2006, awarding more than $700,000 in direct support to Native American artists. The Native Creative Development ProgramTM was designed to address the professional development needs of individual Native artists by providing merit-based funding. Artists use grant funds to broaden and deepen their work, whether through harvesting resources, attending workshops, upgrading equipment, accessing facilities, or developing new skills. Natalie Ball (Klamath), multi-media artist completing her MFA and focusing on harvesting traditional resources as she establishes her practice in her traditional homelands. Dan Friday (Lummi), established glass artist preparing for a large solo show at the Museum of Northwest Art. 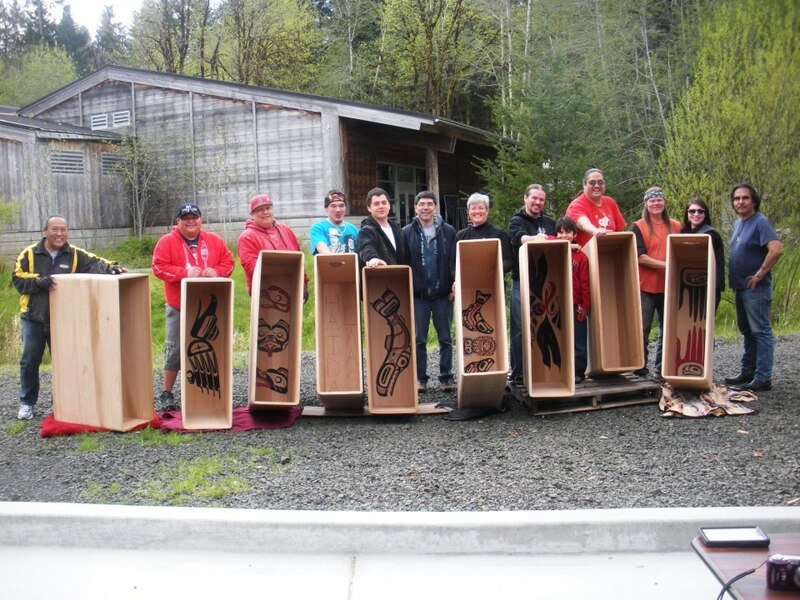 John Goodwin (Makah), established visual artist expanding and improving his wood working shop. Tierra Rose McCarty (Makah), emerging visual artist building her skills in ornamental engraving and traditional Makah design style. Ruby Murray (Osage), writer and photographer working to publish her memoir Don’t Be An Orphan, which tracks Osage removals from Missouri to Kansas to Oklahoma. William Passmore (Colville), established visual artist exploring his heritage through the creation of ten large glass vessels. Lillian Pitt (Warm Springs/Wasco), established visual artist creating several glass works for an upcoming exhibit at the Museum of Contemporary Native Arts. Sara Siestreem (Hanis Coos), multi-media artist and educator preparing to lead a two-week spruce root weaving workshop in the Dzawada’enuxw community in Kingcome, BC. Jeffrey Veregge (Port Gamble S’Klallam), comic book artist upgrading his tools and equipment for improved detail and work flow. Celeste Whitewolf (Umatilla), fiber artist learning to re-create the Plateau Style Huckleberry Basket with the intention of teaching others this ancient design. Paul Wilson (Klamath), photographer creating a body of works that explore the five components that determine hiswaqs (manhood) in the culture of the Klamath Peoples. For more information about the Native Creative Development ProgramTM, and to learn more about the most recent recipients, please see The Longhouse Education and Cultural Center website at http://www.evergreen.edu/longhouse/grantprograms. 2018 is an exciting year at the Longhouse! We will complete the construction of two new buildings, the Fiber Arts Studio and the new, larger Carving Studio. With a design based on the artistic vision of Māori sculptor Lyonel Grant, the Fiber Arts Studio represents the physical embodiment of the Longhouse's decades-long relationships with Māori artists, arts organizations and government supporters in New Zealand. Lyonel Grant and Alex McCarty led a strong team of carvers from New Zealand and the United States, who created the extraordinary art for the Northwest and South Pacific entrances. The interior will feature woven panels collaboratively created by fiber artists from New Zealand, Washington State and Alaska. Recessed into the floor of the studio will be a sand-blasted granite "salmon egg", which represents the life force of the building, by Lyonel Grant. We look forward to welcoming everyone to the naming ceremony on October 13, 2018, 10 am to 2 pm. Funding for the Fiber Arts Studio has come from multiple sources, including grants and individual donations. 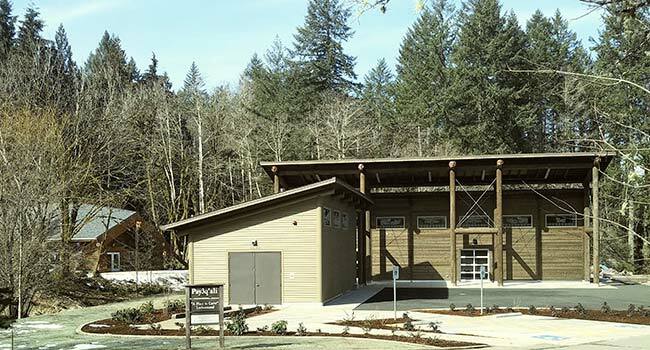 With in-kind support from the Government of New Zealand (Creative New Zealand, through Toi Māori Aotearoa), which sent teams of artists to contribute to the studio since 2013, the $2.5 million Fiber Arts Studio is a landmark feature of the Indigenous Arts Campus at The Evergreen State College. Master weaver Tina Wirihana led a collaborative project across New Zealand to create and present four Tukutuku panels for the Fiber Arts Studio. Artists include: Edna Pahewa, Glenda Joyce Hape, Sonny Hape, Gaylene Henry, Matekino Lawless, & Christina Hurihia Wirihana. Photograph by Melissa Ponder. Following the Fiber Arts Studio, we will build a 2,000 sq. foot carving studio by fall 2018. The existing 800 sq. foot carving studio will become the Indigenous 2-D Design Studio, a place where carvers can design their sculptures before creating them in the larger studio. The new studio will be equipped to accommodate both wood and stone carving. The new carving studio will include a lighted outdoor overhang for work after daylight. David Boxley, Sr. led a bentwood box drum residency after the first carving studio, Pay3q'ali, opened in 2012. We will be hosting weaving and carving residencies in each of the new studios this year, as well as offering our first summer school class in the Fiber Arts Studio in June 2018. Full-time undergraduate classes will begin in the fall of 2018. The Longhouse team, in collaboration with the Museum of Glass, intends to add a cast glass studio to the Indigenous Arts Campus in the future. This series of studios will allow the Longhouse to greatly expand its capacity to offer academic classes and a wider variety of residencies in traditional and contemporary arts. In building the Indigenous Arts Campus, we are simultaneously creating the infrastructure for a planned MFA in Indigenous Arts in the future. The Indigenous Arts Campus will add new dimensions to Evergreen’s educational leadership as an interdisciplinary liberal arts college with a commitment to teaching across significant differences. Shawn Brigman, Phd. is reviving Salish Sturgeon Nose canoe culture on the Upper Columbia waterways with support from the Longhouse's Northwest Heritage Program. Multiple committed groups and individuals have generously contributed funding to the Indigenous Arts Campus studio development. Support for the Fiber Arts Studio came from the Ford Foundation, Margaret A. Cargill Philanthropies, the Surdna Foundation, the Hearst Foundation, the National Endowment for the Arts, The Evergreen State College, seven Northwest tribes, and more than 165 individual donations. Funding for the new carving studio has been secured from Margaret A. Cargill Philanthropies, the Hugh and Jane Ferguson Foundation, and individual donors. We promote Indigenous arts and cultures through education, cultural preservation, creative expression and economic development—learn more. The Longhouse supports Native artists and hosts Native art Sales and Exhibits throughout the year. Fund your art project with the Grant Programs that we offer to Native artists in the Northwest—The 2017 Native Creative Development Grant cycle will be available to Native artists in Washington and Oregon. Check back for more information on when this grant cycle begins. Host your event at the Longhouse with Evergreen’s Conference Services. We host and offer multicultural classes, presentations, performances, and more! Visit our Events page to see what's happening next. The Longhouse is in the process of developing a graduate-level academic program—a Master of Fine Arts in Indigenous Arts. You can support Longhouse programming by purchasing merchandise. 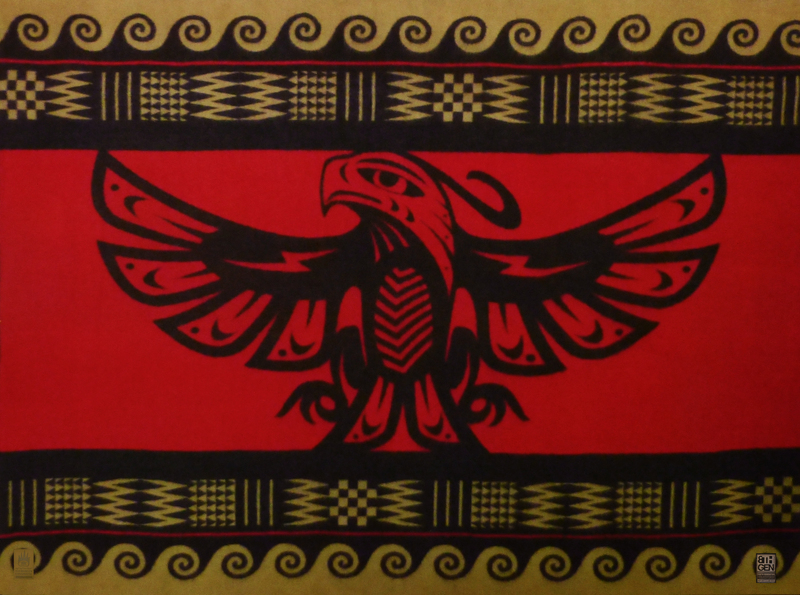 We offer a variety of gifts, including the beautiful Thunderbird Arrives wool blanket—co-designed by Louie Gong (Nooksack) and Longhouse staff, and produced by Louie Gong's Eighth Generation.